For the past eight years, Marguerite Wells, an organic flower farmer, has quietly raised more than $1 million to build seven wind turbines on a hillside outside of Ithaca. During that time, she’s also had a lot of kitchen table discussions with neighbors worried about 475-foot turbines spinning in their backyards. Large renewable projects often take years of planning, but Wells’ project in Tompkins County is unique because she has no energy industry background and has undertaken a major project large companies and investment groups take years to bring to fruition. She’s doing it, she says, to show that renewable energy projects are feasible, a good investment and important for the future of the energy grid. According to Capital New York, Wells has already received many of the key state and local approvals a large project requires and expects the first holes for the turbines to be dug this summer. If completed, the Black Oak Wind Farm in the town of Enfield, about 20 miles west of Ithaca, will be the first community-owned wind farm in New York. 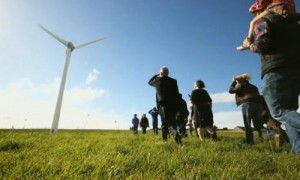 And while its construction is still not guaranteed, landowners have agreed to site the wind turbines on their property. At the same time, Black Oak has received the backing of the state as well as a major community institution. Cornell University has agreed to purchase all of the power produced by the project. The New York State Energy Research and Development Authority will support the project for a decade by purchasing renewable energy credits. NYSERDA will work to encourage more community projects like Black Oak, said Doreen Harris, senior project manager. Wells said there were so few projects like hers, she had to travel to South Dakota to find another community-owned wind farm to copy. Now that she is so close to breaking ground, she said she expects this project won’t be the last time private citizens organize their own utility-scale renewable projects. They can use her ideas, and fit them around the unique needs of their community projects, she said. Black Oak is relatively small. At 12 megawatts, it would provide enough power for about 5,000 homes. 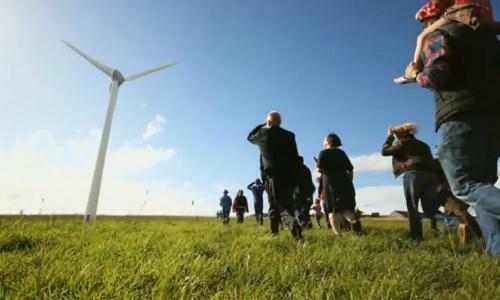 The site in Enfield has average wind speeds of 17 m.p.h., better for generating electricity than other state wind farms that have average wind speeds of 14 m.p.h. The project will cost about $40 million to complete. Wells has raised at least $1 million, much of it from private citizens, including a number who lives near the farm. She said she recruited more than 100 like-minded investors in initial rounds of funding, including those who support clean energy and view it as a chance to make money. The bulk of the funding, she said, will come from banks and private equity firms who see the project as economically viable. The project has been delayed a few times and has been cut in size from 20 megawatts to the current configuration. And while there is no guarantee Wells will get the money she needs in time to begin construction in just a few months, she said she is close to final deals with three major financial backers. She is also working on a payment in lieu of taxes, or PILOT, agreement with the Ithaca city school district, the town of Enfield and the Odessa Montour Central School District. For Cornell, the project allows the school to move closer to a goal of zero carbon emissions by 2035. After announcing a fracking ban in December, Governor Andrew Cuomo said some of the areas that would have benefited from natural gas drilling could now receive clean energy projects. Environmental groups that have spent years mostly focused on fracking said they would turn their attention toward promoting renewable energy. Those efforts have yet to be rolled out. Wells is ahead of both, though the state signed on to support her project in 2013 because it was economically competitive. Environmental groups have been slow to realize its promise, but Wells is traveling to Albany soon to meet with them to encourage more outreach to their members on investments in community renewables. The project is also an example of what the state needs most to grow its renewable energy portfolio, private capital invested in major initiatives that can succeed in an open market without major subsidies. After years of stagnant growth, Cuomo has launched billions of dollars in clean energy initiatives, most with the aim of aligning solar, wind and other renewable sources with the market, so that they can exist without subsidies. The state’s Reforming Energy Vision initiative, which is being watched nationally, is designed to make the state energy markets more accomodating to renewable projects. It’s also the type of clean energy resource, a utility-scale project, that the grid needs if it is to reduce carbon emissions 80 percent by 2050, as Cuomo has pledged. Wind projects have increased more than any other renewable energy under Cuomo, by about 600 megawatts to a total of 1,875 megawatts since 2010. Still, the state got just 23 percent of its power from renewables in 2014, far short of former governor George Pataki’s plan to get 30 percent of the state’s power from renewables by the end of this year. Wells said it has helped that her project is near liberal Ithaca, a place where people appreciate renewable energy, she said. That made the tough sell of convincing people to have turbines as tall as a skyscraper spinning in their backyards. “Ithacans take green energy so seriously, they know they can’t say ‘not in my county, in someone else’s county,’” she said. Thus far, the project has received little support from the state’s most prominent environmental groups, Wells said, despite years of pitches. Wells said getting popular public support, and showing people the investment power of renewable projects, is her next push. She has a meeting with green groups in Albany later this month, to get them on board with the project and to convince them to encourage their members to invest in the future of the energy grid. “They haven’t seen anything like me and don’t know how to support me,” she said.